There are a few hellish episodes in Earth’s unfathomably long history that make even Hollywood’s most bombastic disaster movie look like a sunny picnic. The end-Cretaceous extinction is the most well-known, since it wiped out the dinosaurs (minus the birds, of course) and opened the door for the mammalian revolution—which most human beings regard as generally a good thing. Though the story is probably familiar, there are still significant questions about exactly what happened during that cataclysm. 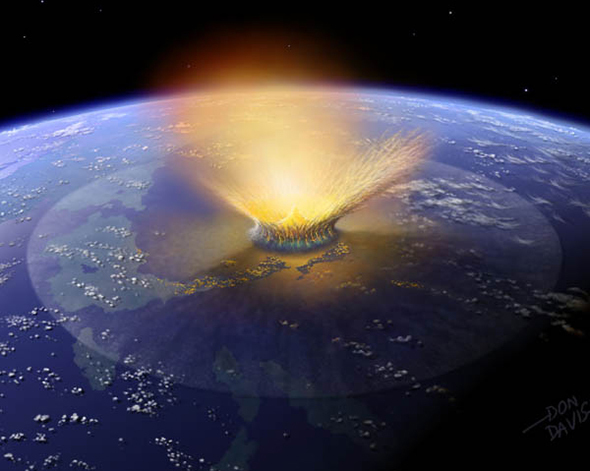 Many species were seemingly in trouble before that colossal meteoroid crashed into the coastal Yucatan, perhaps partly because of a long-lived series of massive volcanic eruptions in what is now India. This has led some to question whether the impact was as deadly as it’s made out to be. But we’ve also filled in some details of just how the meteoroid impact would mess up the Earth, and these include mind-blowing tsunamis, rampant wildfires, and see-sawing climate effects. So how lethal was the impact? A team led by Charles Bardeen at the National Center for Atmospheric Research employed a climate model to investigate one major aspect of this story. In many places around the world, there is a thin geologic layer that marks the time of the impact event. It contains soot that apparently blanketed the planet after wildfires kicked it up into the air. (These wildfires would be triggered globally by the heat of debris reentering the atmosphere.) Was there enough soot to black out the Sun?